NVCOG partnered with the Naugatuck River Greenway Steering Committee (NRGSC), the University of Connecticut College of Agriculture, Health and Natural Resources Department of Extension (Extension) and The Connecticut Center of Economic Analysis (CCEA) at the UConn School of Economics to study the potential for economic impacts that the completion of the Naugatuck River Greenway will likely have on the region and on the eleven communities along the NRG route. The study has been generously funded by the Connecticut Community Foundation, The Katherine Matthies Foundation, The Valley Community Foundation, and The Community Foundation of Northwest Connecticut with assistance from the Northwest Hills Council of Governments. The study was endorsed by both the Naugatuck River Greenway Steering Committee and the Naugatuck Valley Council of Governments Board. The project was initiated in the Summer of 2015 and required extensive data collection on regional multiuse trails. Trail counts were conducted using automatic trail counters during the summer and fall of 2015 on sections of the Naugatuck River Greenway in Derby, Naugatuck and Beacon Falls as well as on similar trails in the area: the Middlebury Greenway in Middlebury and the Sue Grossman Still River Greenway in Torrington. User Intercept surveys were conducted on the same sections of trail in the Fall of 2015 to investigate the demographics of trail users and their spending habits related to trail use. Focus group meetings were conducted in Spring of 2016 with trail administrators, local business owners and health professionals along the Farmington Canal Heritage Trail. The purpose of the focus groups was to gain an understanding of how a more complete trail similar to the NRG is being used, maintained and benefitted from, as well as, to gather best practices to pass on to NRG communities. 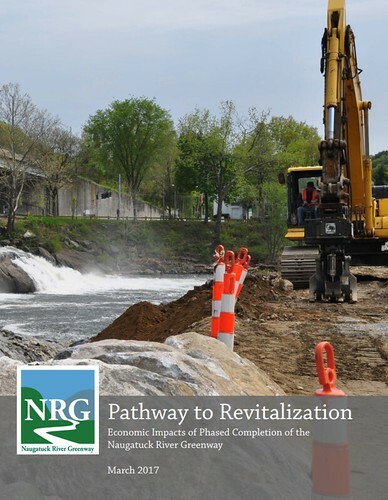 Information from the trail counts, surveys and focus groups was used by CCEA to inform an economic model that estimated the potential economic impacts that the construction and use of the Naugatuck River Greenway will have on local communities. A report is now available that details methods and findings, and NVCOG has produced individual community summary sheets that are being presented to the 11 NRG communities. Please see the final and intermediate reports and summaries below.